Experience an outdoor sound system which blends in with your garden. 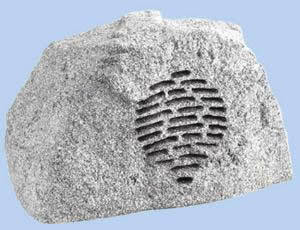 This high quality speaker is built with the look and feel of a natural landscape rock and is totally weatherproof so can be used all year round. Very easy to install and rated at 100W, it can be driven by a standard amplifier (not included) and is a fantastic addition to any garden or other outdoor area. Try using with our DST Garden Switch and DST HiFi Player (both not included) and your own amplifier. Pressing the weatherproof DST Garden Switch will then cause different music to play in the garden. A great way to introduce interaction into the outdoors. Dimensions: 430W x 250D x 305mmH. Supplied as a single speaker.